A3982 Stepper Driver 1.0 - Make Your Bot! The A3982 stepper driver is a very simple constant current (chopper) design based on the Allegro part of the same name. With sufficient cooling, it can supply up to two amps of current to each motor phase. Currently it operates at 12 volts maximum, but it can easily run at 24 volts if all of the capacitors have sufficient voltage rating. 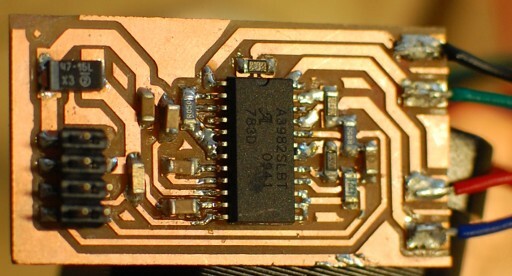 This board is designed to work with a parallel interface. Three of these boards will fit on a single 3x2" blank PCB. In the Mantis Mill Version 8, this board will drive the motors about 60 in/s (about 720 rpm) when running at 12 volts. The two small unlabelled resistors in the board placement drawing are 0 ohm (short) resistors. All components except the large capacitor are size 1206. The large pads on the far right of the board are solder pads for the four motor wires. Each pair of pads drives one coil.